Developed by Aranock-online for Windows. Aranock is based off of the now-closed game called Mercenaries of Astonia V2, which was a much loved game. Aranock aims to improve on it with all new graphics, quests and game play. Although Astonia is closed, its legacy continues, and we have many original Astonia players playing Aranock, and new players join it every day. 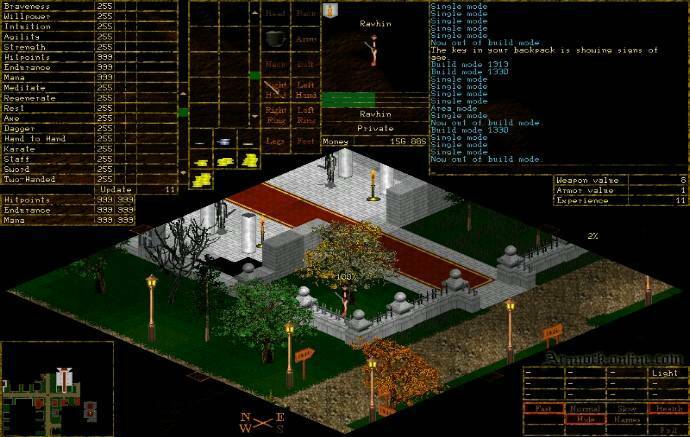 Astonia, astonia v2 or mercenaries of astonia as it was also known was a MMORPG game developed in the late 90's (is now closed), it was an emensly popular free online role playing game (MMORPG), with a fan base thats well over 16 years old. Aranock is a clone of astonia v2 with many improvements to carry on its legacy as a great game for everyone. Luck is a variable hidden stat, you can top up your luck by donating items to the gods via the golden shrines. To check to see how much luck you have, speak with the begger outside of Skua temple and hand him 50 gold coins, he will then tell you how much luck you have. Guardian angel is a skill that you can obtain buy purchasing the scroll from Sigurd, Providing your guardian angel modification stat is high enough, it will spare some items from being lost at death. Eventually once you've maxed the skill it will save all items and gold upon death. Player killing is an optional extra, you have to opt into it inorder to kill other players, and be killed by other players. Player killing is known as the purple order, you can become a member by visiting the purple temple and speaking with the priest. When you kill or have been killed by another player, that player will then have full access to your grave, meaning they can take any and all items from it they wish. Unlike regular quests are daily quests that are issued by the admin or game master. These things change over time so you won’t have to worry about playing the same quests over and over again. New quests often kills the game's linearity and of course a good reason for players to look forward to something every time they log in. This is a good game a great community. It has eveolved over the years. Old players keep returning and new players enjoy the challenge. Try it and see but be prepared to become slightly adicted. Thanks you, Lee. I have already changed it.